Marianne Neumann has one goal in life: to find her lost younger sister, Sophie. When Marianne takes a job as a placing agent with the Children's Aid Society in 1858 New York, she not only hopes to give children a better life but seeks to discover whether Sophie ended up leaving the city on an orphan train. Andrew Brady, her fellow agent on her first placing trip, is a former schoolteacher who has an easy way with the children--firm but tender and funny. Underneath his handsome charm, though, seems to linger a grief that won't go away--and a secret from his past that he keeps hidden. As the two team up placing orphans amid small railroad towns in Illinois, they find themselves growing ever closer . . . until a shocking tragedy threatens to upend all their work and change one of their lives forever. An absolutely incredible historical romance!
" 'Go away!' . . .. . . But the steps grew nearer. 'Don't come around the desk. Please . . .. ' " Not the most traditional of introductions, but maybe it was just meant to be, that Marianne Neumann and Andrew Brady should happen to meet under such entertaining circumstances. Both were employed as placing agents with the Children's Aid Society of New York, and on the eve of an important cross country trip; chaperoning a train car full of orphans who were anxiously anticipating placements within families through-out small Illinois railroad towns. Whereas Andrew appears lighthearted and impulsive, Marianne feels cautious and reserved, viewing the trip as an opportunity to search for a much beloved sister, who had virtually disappeared. As the miles disappear behind them, their hours of close proximity forge an invisible bond of attraction, between themselves and the children, making the decisions ahead of them all the more painful. Sometimes loving means letting go and often times "courage takes many forms". Thankfully, there is a God "whose strength is made perfect in weakness". A lovely historical with plenty of blush rendering romance! I received a copy of this book from the author and publisher. The opinions state are entirely my own. I know, I know I say this every time but it's completely true, Jody Hedlund seems to outdo her previous book with every new novel penned! There's no way I can pick a favorite from even this series alone because that's an impossible choice. When I pick up a new book by this author I know without a doubt that I'm going to love it. How so? With every chapter I am drawn further and further into the story. Once I start it takes an emergency, (pretty much house fire, broken bone type emergency) to pull me away. I wish I could explain why this book was so good! But the inability to express what I'm thinking into words is why I'm not a writer. All I know is that the chemistry between the two characters, the heart-compelling plot… it left me with a feeling of hope and inspiration for hours. I think that's when an author can know that they succeeded. 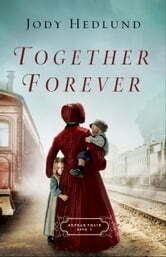 Together Forever - Orphan Train Book 2, is another winner by Jody Hedlund. She writes wonderful historical novels. I know when I'm reading one of hers that actual events and characters may be included, that's why I always read the author's notes in the back of the book. She researches her topic well so that the actual facts of history are accurate. It's a great way to learn in among the fiction. It's not absolutely imperative that you read book one, With You Always, to enjoy this one but getting some of the background might be helpful so that you don't feel lost, and why miss out on a great read? The 1850s-1860s is the time frame and it begins in New York City. A financial crisis has occurred and some parents are forced to place their children in orphanages because they can no longer support them. Some children lose their parents to disease and death. Some are forced out on the streets to survive the best they can. The Children's Aid Society takes the children on trains with agents hired to go out west with them and find families to adopt them. Some are good placements, some are not. Farmers take some of the older boys to use as free labor. Stops were made in different towns along the railroad line and the most desirable were chosen first. I felt so sad for some in the story that were last or not chosen at all. The characters were easy to care about and follow. The two agents in this story Marianne and Andrew, worked together and became better acquainted on their long placing journey. They both had pasts with regrets and insecurities and kept them hidden from each other. I loved Drew's humor and Marianne's motherly instincts. God gave her some revelations about herself toward the end that helped her let go when the time was right. This was full of problems, misunderstandings but also lots of adventure and love. I received a complimentary copy of this book from the author/publisher but was not required to write a review. Together Forever (Orphan Train, #2) by Jody Hedlund is a powerful and historically based inspirational Historical Romance set in 1858 New York. While book 2 in the "Ophan Train", it can be read as a stand alone. Marianne Neumann and Andrew Brady are agents for the Children's Aid Society. Powerfully and well written with memorable characters and a fascinating story. A very satisfying and enjoyable read. I look forward to the next book in this powerful and compelling series. "I voluntarily received a complimentary copy, however, these are my honest opinions. I was in no way required nor compensated to write a review."